I’m often asked for low propoint but impressive starter dishes for the Weight Watchers out there trying to cook a three course meal. I’ve come up with loads of different options for this but this has to be one of my favourites. Who doesn’t love a prawn cocktail!! But usually it is lathered with a creamy dressing and some tiddly prawns and not much else. This recipe is nothing like that. It is both filling, healthy and packed with flavour. I’ve made it at two dinner parties now and no one could believe that it was essentially just a really fancy prawn cocktail! If you don’t fancy serving the mixture stuffed in the avocado, see my pictures below for another ‘deconstructed’ serving suggestion. 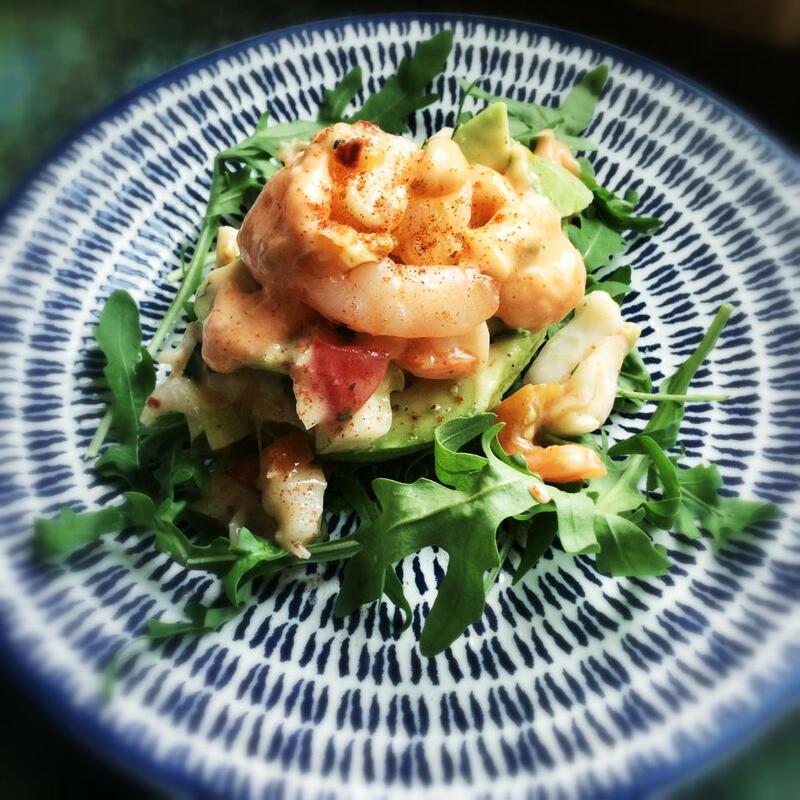 In this recipe it really is worth using some really good quality, large king prawns. I used some from my recent delivery from Ocean Classics and I have to say they were delicious. So meaty and juicy!! In a large bowl combine the red onion, pepper, cucumber, tomatoes, ground cumin and fresh coriander. Mix everything together. Season with salt and black pepper. Halve your avocado, remove the stone and peel. Scoop out a little of the centre to make a large well for stuffing, chopping the spare avocado and adding to the vegetable mix above. Squeeze some lime juice over the avocado to stop it going brown. 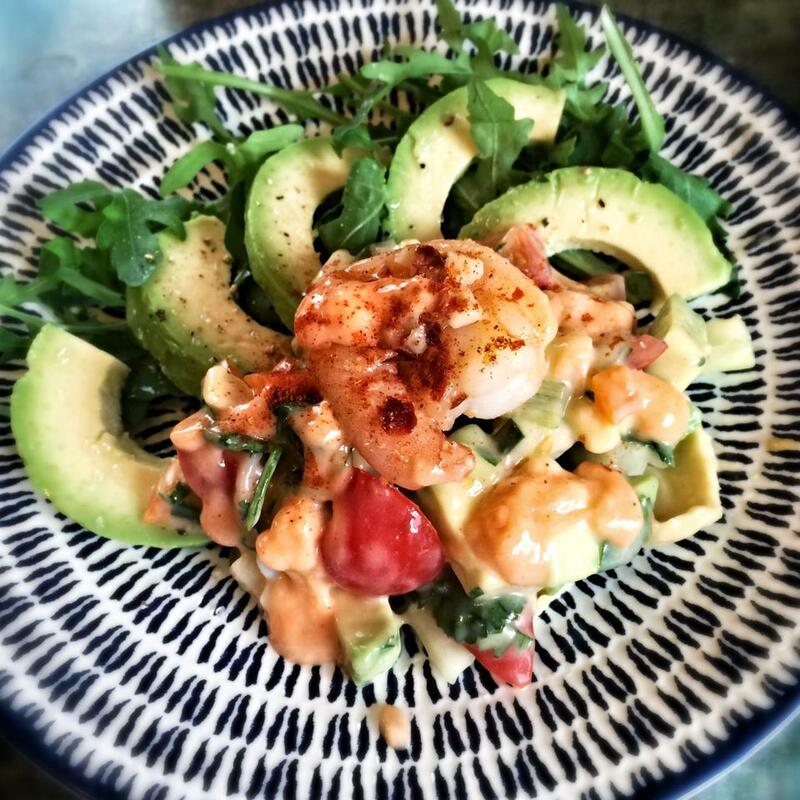 In a smaller bowl mix the mayo with the chilli sauce and juice of ½ lime. Add most of the sauce to the vegetables and toss to coat. Reserve 2 tsp of the sauce. Pop to one side (or in the fridge). Then, take a large frying pan, spray with 1kal and then fry the garlic and chilli until softened but not brown. Add a little water if the pan is dry. Add the prawns and fry on a high heat for 2 minutes on each side (or until cooked through). Turn the heat off the pan. At this point you are ready to plate up. Take your plate and pop a handful of salad leaves on each. Top with one half of the avocado, stuff with the vegetable mix and top with the king prawns. Finish with a tsp of the dressing, a sprinkle of the garlic and chilli and a squeeze of lime. p.s if you fancy making the deconstructed version, see my pic below. I just sliced the avocado and piled everything next to it! !